Here at Warners Moving & Storage, we're the movers with decades of experiences helping families with their move in York, PA and far beyond. So we've learned a few things about how families handle the challenges. Moving day is daunting even for the most organized and energetic, and it is often the most difficult for kids. You might not believe that it can be an experience you’ll remember fondly, but it can be. Here are some tips from seasoned parents who have made it work. If your kids are typical, there will be toys that have not been touched for perhaps years. If you explain that these forgotten toys could bring joy to a child who doesn’t have as much and suggest donating, chances are good that the kids will agree. Then while you pack, they’ll spend their time deciding which toys to keep and which to give away. The bonus – it will also lighten the packing load. I’m sure it’s no secret to you that kids can become difficult when they’re uncertain about where they are going to be next. A visit to the new home before moving day reduce their anxiety; but if that’s not possible, then sharing pictures is helpful too – especially if they can see their new room and perhaps begin to plan how it will look once they have gotten settled. It’s a bonus if you can visit the new neighborhood. Point out schools, parks and other places of interest. Sometimes kids get anxious seeing that all their things are packed up. If you take the time to let them pack their favorite toys in their own box which you clearly mark to be found easily, it can take the worry away. They will love being included and the chore will keep them busy and maybe give you extra help. Find a place out of the work area and ask the kids to decorate the boxes. If you use washable crayons, there will be no mess; and they will love the chance to create their masterpieces on these “canvases”. Don’t forget to praise their work and thank them for their help! Accept that complete the entire move while taking care of the kids just creates unnecessary stress for everyone. Don’t shy away from taking the help offered by friends and family. Putting your children in trusted hands where they can be entertained and supervised gives you the kid-free hours you need to complete the move and prevents moving day meltdowns. Set aside one or more bags or boxes to hold the special items you’ll need during the first few days after you move in. From pajamas, blankets, favorite toys, snacks, toothbrushes, an extra set of clothes for each child, and whatever else you know you’ll need right away will turn the day after the move from a challenge to a pleasant memory. Here at Warners Moving & Storage in York County, PA, we are experienced with moving households (residential moving) -- across the country, down the street or somewhere in between. We can help take the stress out of your moving day. Just contact us to find out how we can help or get a quote for our service. If you’ll soon be moving to a new neighborhood, you might be wondering about your neighbors. In fact, might they be curious about you as well? In years past, when someone new moved into the neighborhood, the established residents would make it a point to visit and introduce themselves as a welcome to the neighborhood. However, we are more of a transient society now, and times have changed. If you want to meet your neighbors once you’ve moved in, why not plan to make the first move? Here are some effective ways to reach out in the neighborhood. This is an especially good idea if you did not have time to sell off those no-longer-wanted items before your move. But now that you have identified items that you no longer want or need, you have a perfect excuse to hold a yard sale. It’s a good bet that your neighbors will take the opportunity to get to know you as they browse your treasures. For a slight twist on this concept, why not visit other yard sales in the area. 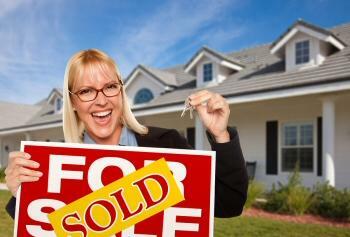 You’ll get to know your neighbors while exploring what’s for sale. Don’t know where to find the sales? Try the Yard Sale Treasure Map app for iPhone or Android to get started. If you’re visible in your new neighborhood, then you’re approachable. Getting outdoors to trim and groom existing plantings or even to add new flower beds or shrubbery is not only healthy, but it puts you in the right place for a visit from your new neighbors. Don’t worry, even if you have never done yard work or gardening, you can still try this approach if you check out this site on Gardening for Beginners. Who knows… those established residents might just be seasoned green thumbs willing to offer advice and exchange ideas. If you have children or pets, then the local neighborhood park or playground is where you’ll find other parents and pet owners. It’s much easier to strike up a conversation when you have common interests – especially children and puppies. If you’re not sure where to find the local parks in your area, check out Map of Play on your computer or smartphone. Once you’ve connected with neighbors, it might just be a perfect time to arrange a play date, to get to know each other better. If you will be moving to a townhouse or condo community, there could be access restrictions for your moving van and/or parking guidelines for off-loading your belongings. By checking in advance and letting your moving company know, you could avoid unnecessary stress and possibly save time and expense. Here at Warners Moving & Storage, we are always ready to work with you to make your moving experience as smooth as possible. Once you know you’ll be moving, checking with us as far in advance as possible will help us to help you. Why not request a free quote today? If you have lived in your current home for more than a year, then chances are you’ve collected clutter and junk that should be discarded, sold or donated instead of being packed and moved to take up space in your new house. So take an inventory of your belongings a month or two before the time to start packing. Identify those items that would just gather dust in your new home and make plans to get rid of them. A proven rule of thumb: If you haven’t needed an item in a year, then let it go. If you have the time before your move, consider a moving sale. This is the time of the yeaar for garage and yard sales; and the old adage, “One man’s trash is another man’s treasure” applies here. 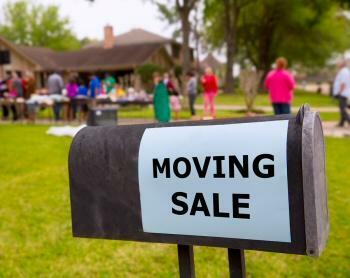 Whatever funds you raise from the moving sale can be applied to your moving expenses. Don’t want the hassle of a garage or yard sale? Then think about using social media to offer those unwanted items to your community or contact a local charity and arrange to donate items that can be put to a good purpose. Waiting too long will likely result in these useless items being transferred to your new home where they will likely languish in the basement or attic – maybe even until your next move! Moving Tip: Once you have purged your junk and know what you'll be taking along to your new home, it's time to engage a moving company and plan for moving day. Here at Warners Moving & Storage, we have been moving residential households from coast to coast and all points in-between since 1943. Our experienced moving consultants can help you take the right steps leading up to moving day and advise you all along the way. We look forward to answering your questions and helping to make your move a success. If you're actively house shopping, then it won't be long before you'll have the keys to your new home in hand and Moving Day will be upon you. Whether you will be moving out of state or within your local area, the time you’ll need for a move is much the same. While it might seem that you have a lot of time before moving day, if you put off tasks such as packing for too long, your moving experience will be a very stressful one in the end. The key to a stress-free move is to have a Moving Plan, organize all of your household items and belongings in advance and begin to pack weeks before moving day. Just be sure set aside clothing and any everyday items you’ll need right up to the day that you move so that you don't have to search through freshly packed boxes for items like the coffee pot, your everyday robe and slippers and the dog's water bowl. The items you use day to day should be packed just before Moving Day. Be sure to have a system for packing. As you pack your moving boxes, be sure to place all related items together so that they can go into the same room at your destination. Then label your boxes to show the contents and what room they should be moved to (Example: Books – Den). Organizing your belongings as you pack and labeling properly will save you from having to move items from room to room once everything has arrived at your new home. Here at Warners Moving & Storage in York county, PA, we know what it takes to move smartly. We have been moving families and households like yours since 1943. 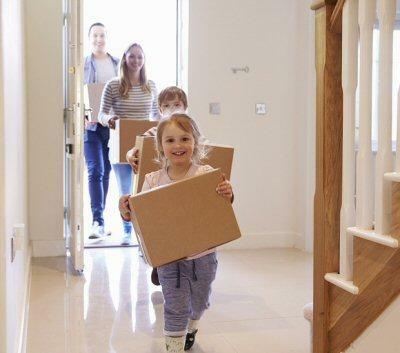 So whether your new home is across the country, down the street or somewhere in between, why not contact our experienced staff well before moving day to find out how we can help.